A super entry of 240 calves and weanlings on Thursday, March 28 met a flying trade for all types on offer. Workman Farms, Aghadowey, Aberdeen Angus £400; M and H Gilmour, Ballymoney, Montbeliarde £380, £345, £280; D McKinney, Maghera, Aberdeen Angus £350; J and B Rankin, Limavady, Charolais £375; R and R Cousley, Moneymore, Fleckvieh £342, £312; S Carroll, Dungannon, Aberdeen Angus £340; W Elliott, Tobermore, Aberdeen Angus £338, £255; D Montgomery, Dungannon, Charolais £332, £325, Aberdeen Angus £235; R Mulholland, Portglenone, Belgian Blue £270, £225; D Gordon, Kilrea, Belgian Blue £297, £262, Aberdeen Angus £260; Ballymena farmer, Montbeliarde £285; G and E Pollock, Ballymoney, Montbeliarde £272; J Chestnutt, Portrush, Aberdeen Angus £250, £240; W K Shiels, Maghera, Aberdeen Angus £242, Belgian Blue £225; W Campbell, Magherafelt, Shorthorn beef £220; M Currie, Ballymoney, Limousin £220 and Lakeview Farms, Ballyronan, Aberdeen Angus £208. Maghera farmer, Aberdeen Angus £380; Workman Farms, Aghadowey, Aberdeen Angus £380; D McKinney, Maghera, Aberdeen Angus £295; D Montgomery, Dungannon, Charolais £250; M Currie, Ballymoney, Hereford £240, Limousin £235; Ballymena farmer, Aberdeen Angus £235, Belgian Blue £220; Ballymena farmer, Aberdeen Angus £225; D Gordon, Kilrea, Belgian Blue £222; S Carroll, Dungannon, Aberdeen Angus £218; J Chestnutt, Portrush, Aberdeen Angus £215; W Elliott, Tobermore, Aberdeen Angus £215; Lakeview Farms, Ballyronan, Aberdeen Angus £205 and E Tosh, Castlerock, Limousin £200. Good young calves to £180. 90 on offer with more required to satisfy demand. A good entry of 400 on Monday, April 1 met a sharper trade. Lambs to £109 to 474per kg. 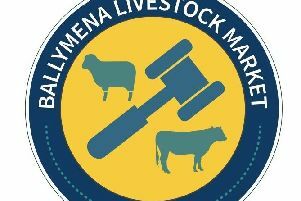 Portglenone farmer, 23k, £109 (474), 23k, £99.70 (433), 24k, £101.20 (422), 24k, £100 (417); G Wright, Ballymoney, 21k, £98.50 (469), 23.5k, £106 (451); Dunloy farmer, 19k, £86 (453), 24.5k, £103.50 (422); J McKendry, Ballymoney, 23.5k, £105 (447); W Armstrong, Kilrea, 23.5k, £104 (443); W Jeffers, Coleraine, 22k, £97.50 (443), 26k, £106.80 (411); Cookstown farmer, 24k, £106.20 (443), 25.5k, £107.80 (423); J Hegarty, Ballymoney, 21k, £92 (438); M McCaughey, Coleraine, 20.5k, £89 (434); M Smyth, Macosquin, 24k, £99.80 (416) and Gilmore and Co, Boveedy, 26k, £107 (412). A small entry of dairy stock on Tuesday, April 2 met a super trade to a top of £1,820 for a calved heifer. W Millar (Jnr), Coleraine, calved heifers to £1,820, £1,690, £1,670, springing heifer £1,510 and Tobermore farmer, calved heifers to £1,650, £1,510. A good entry of 350 fat cow, suckler and store cattle stock on Wednesday, April 3 Kilrea met a sharper trade with quality stores in demand. Steers sold to £1,400, heifers sold to £1,225 and fat cows sold to £1,045. Kilrea farmer, 640k Limousin £1,045 (163), 660k Simmental £850 (129); W J McCurdy, Ballymoney, 620k Aberdeen Angus £950 (153); Rasharkin farmer, 670k Simmental £980 (146), 570k, £825 (145); R and A Smyth, Dungiven, 580k Friesian £790 (136); A McIlroy, Garvagh, 630k Hereford £810 (129); Swatragh farmer, 660k Hereford £830 (126); W Wylie, Dunloy, 590k Friesian £700 (119) and Limavady farmer, 580k Aberdeen Angus £675 (116). Limavady farmer, Aberdeen Angus second calver with Charolais bull calf at foot to £1,520. R McCaw, Ballycastle, 330k Charolais £780 (236), 340k, £770 (227), 370k, £825 (223), 350k, £765 (219), 370k, £780 (211), 370k, £730 (197); S and D Donnelly, Ballintoy, 350k Charolais £820 (234), 330k, £750 (227), 350k, £780 (223), 360k, £800 (222), 350k, £775 (221), 340k, £735 (216); Ballymoney farmer, 520k Charolais £1,220 (235), 520k, £1,145 (220), 520k, £1,120 (215), 530k, £1,125 (212), 530k, £1,100 (208), 520k, £1,070 (206), 560k, £1,145 (205), 460k Limousin £940 (204), 560k Charolais £1,140 (204), 430k, £860 (200), 510k Limousin £1,010 (198), 530k Charolais £1,050 (198), 500k, £980 (196), 550k, £1,055 (192); W McMullan, Ballycastle, 320k Charolais £745 (233), 270k, £570 (211), 310k, £640 (207), 350k Limousin £690 (197), 330k Charolais £650 (197); Maghera farmer, 320k Simmental £730 (228); Antrim farmer, 310k Limousin £705 (227), 440k Shorthorn beef £870 (198); W J McCurdy, Ballymoney, 390k Limousin £865 (222), 350k, £705 (201); W and P McCallion, Portglenone, 360k Limousin £795 (221), 370k, £805 (218), 360k, £775 (215), 400k, £850 (213); A Irwin, Garvagh, 410k Friesian £885 (216); J Caskey, Kilrea, 520k Limousin £1,095 (211), 590k Charolais £1,130 (192); D McLaughlin, Dunloy, 360k Limousin £755 (210), 390k Simmental £790 (203), 350k, £695 (199); A Stewart, Ballymena, 570k Charolais £1,195 (210), 540k, £1,130 (209), 580k, £1,200 (207), 580k, £1,185 (204), 550k, £1,120 (204), 540k £1,085 (201), 580k, £1,135 (196), 630k, £1,225 (194), 540k, £1,035 (192); C McIntyre, Macosquin, 410k Simmental £845 (206); J A Millen, Macosquin, 310k Aberdeen Angus £635 (205); A Dougherty, Castlerock, 330k Charolais £670 (203), 340k, £665 (196); J G Linton, Garvagh, 520k Charolais £1,045 (201) and R Mulholland, Portglenone, 430k Charolais £865 (201). Portglenone farmer, 320k Limousin £800 (250), 320k, £765 (239), 370k Charolais £850 (230), 380k Limousin £850 (224), 440k, £935 (213); Ballymoney farmer, 270k Belgian Blue £670 (248), 260k Charolais £565 (217); Antrim farmer, 330k Limousin £785 (238); S J Wilson, Dungiven, 390k Limousin £900 (231), 340k, £775 (228), 350k, £790 (226), 350k, £775 (221), 400k, £880 (220), 390k, £845 (217), 380k, £820 (216), 360k, £775 (215), 400k, £845 (211), 460k, £920 (200), 410k, £805 (196); R McCaw, Ballycastle, 410k Charolais £930 (227), 440k, £945 (215), 430k, £905 (211), 490k, £1,015 (207), 430k, £865 (201); P Gilmore, Kilrea, 350k Limousin £790 (226), 370k, £800 (216), 400k, £810 (203), 430k, £855 (199), 390k, £770 (197); Castledawson farmer, 400k Charolais £900 (225), 380k, £850 (224), 380k, £835 (220), 370k, £770 (208), 470k, £910 (194), 470k, £905 (193), 420k Saler £800 (191); A Lindsay, Coleraine, 560k Limousin £1,150 (205), 570k, £1,150 (202), 550k, £1,105 (201), 570k, £1,140 (200), 630k, £1,200 (191); T Scott, Swatragh, 340k Simmental £760 (224), 390k Limousin £855 (219), 370k, £780 (211), 440k, £870 (198); T Campbell, Killykergan, 480k Aberdeen Angus £990 (206); G Boyce, Garvagh, 560k Limousin £1,145 (205); W J McCurdy, Ballymoney, 370k Aberdeen Angus £740 (200), 430k, £830 (193); Workman Farms, Aghadowey, 320k Aberdeen Angus £640 (200) and D McClure, Kilraughts, 510k Aberdeen Angus £1,000 (196), 530k, £1,020 (193).